If you live in the NW Iowa region we have some exciting news! Iowa Gun Owners will be coming to the Sioux City Gun Show this Friday and Saturday. The show is being held in the Sioux City Convention Center, which is located at 801 4th St, Sioux City, IA 51101 in the heart of downtown Sioux City. This is the largest gun show in NW IA and it’s always well stocked with guns, ammo, gear and more. Iowa Gun Owners will be out there Friday from 4-9pm and all day Saturday. Please note, we’ll not be there on Sunday. I hope you’ll stop by and get involved in our push to advance Stand-Your-Ground law by signing your petition to the Iowa Legislature. While you’re there you can join and pick up a free T-Shirt, grab a free decal, and a stack of our “No Guns, No Money” business cards to hand out when you meet an anti-gun business! Even better, if you stop by in the early morning hours on Saturday, you’ll have a chance to personally meet Iowa Gun Owners’ lead bill sponsor in the Iowa Senate – as Senator Rick Bertrand will be there to talk to gun owners for a limited time Saturday morning! Be sure to stop by and thank Rick for his leadership on the 2nd Amendment during the lengthy 2015 legislative session. 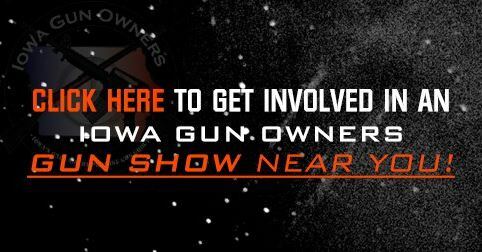 In addition, if you’d like to volunteer during this show for a 4-hour time slot, Iowa Gun Owners will pay your admission to the show and give you a free IGO T-Shirt and hat! You can volunteer Friday evening, Saturday morning, or Saturday afternoon. To get involved, click the box below and someone from our office will call you right away. P.S. Iowa Gun Owners will be at the Sioux City Gun Show this weekend, on Friday and Saturday! Come on out and get involved in our fight to advance Stand-Your-Ground law here in Iowa! What’s more, if you stop by Saturday morning, you’ll be able to meet and chat with the most pro-gun legislator in the Iowa legislature, as Senator Rick Bertrand will be there Saturday morning to meet with gun owners! And if you can volunteer for 4 hours, we’ll happily pay your admission to the show and make sure you leave with a free IGO T-Shirt and hat!